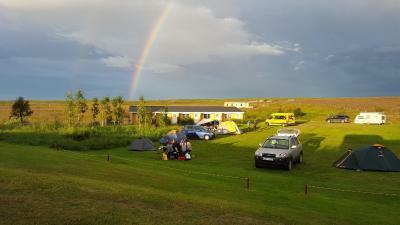 Lock in a great price for Fossholl Guesthouse – rated 8.3 by recent guests! location, free breakfast, cleanliness. and the location!! Location is very good, just next to the fall. Staffs are very nice. We checked in very late at night but they were willing to wait for us. The location. It was serene and a place to stay when you're not in a hurry. The main restaurant was only open until about the time that tourists would arrive and then the tourist center would open where there are lunch foods, souvenirs and coffee. It was really fun going back and forth. This kept the breakfast/dinner restaurant from being packed so that hotel guests always had a peaceful place to eat. The waterfall is in view, you can hear it from your room and it was just the best. 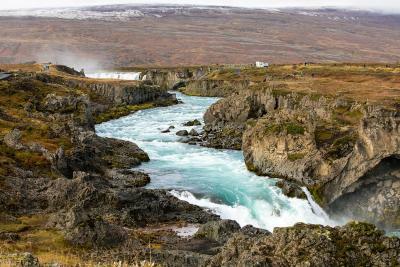 Short walk to Godafoss. Breakfast was excellent, too. Breakfast was good. Location, near the waterfall, was very good. The breakfast had a lot of options. The staff was friendly. The location was near a major attraction. Great location, very attractive building and a nice restaurant.. Staff were great, albeit a with a slightly chaotic atmosphere which turned out to be due too the fact they had only been running the place for a few days. A family run affair, very welcoming. 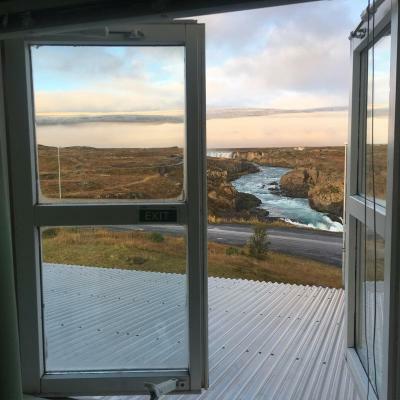 Room in an annexe was spacious with a view of Godafoss. 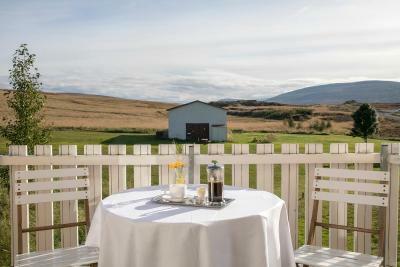 Perfect place to stay after travelling the Sprengisandur route from the south. our experience at the guesthouse was marvelous. 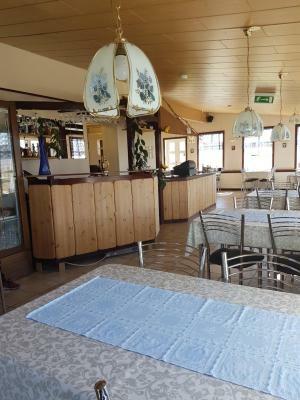 we are extremely impressed by the staff who are so very friendly, helpful and with great hospitality. they also made an effort to get to know the guests well. 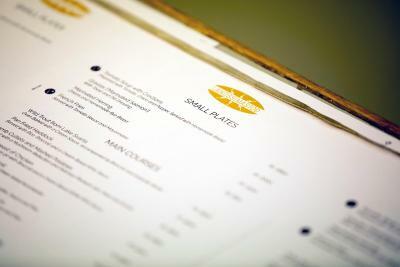 the food at the restaurant was excellent and we highly recommend one should try. the lady chef, Germa, and her mom deserved the credits for the success of the restaurant. the location is also perfect as one could see the Godasfoss from the hostel. convenient parking spaces. the yellow huts or little houses are full of characters and uniqueness. 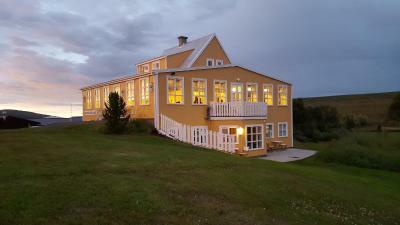 we are planning to visit Iceland again and definitely look to go back to the same hostel again. 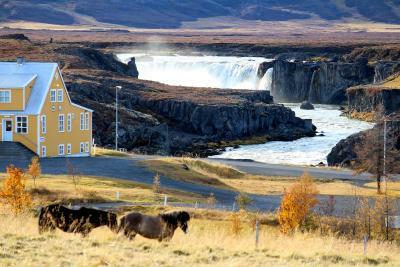 Good location, Godafoss just 300m away. Nice scenery surrounded with mountains view and water falls. Staffs are friendly and helpful. Strongly recommended place for holiday stay. 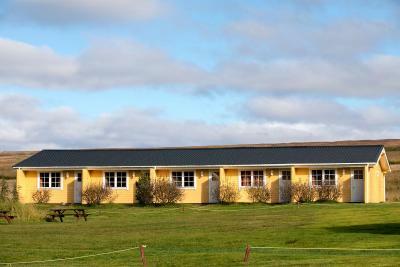 Fossholl Guesthouse is just 1,650 feet from Goðafoss Waterfall and Iceland’s famous Route 1 beltway. It offers basic accommodations, free Wi-Fi internet access and free private parking. Guesthouse Fossholl’s rooms have either private or shared bathrooms. 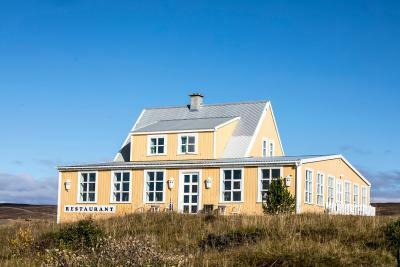 The on-site restaurant offers traditional Icelandic dishes and scenic views of the waterfall. Nearby facilities include a food shop and a gas pump. A 35-minute drive away is Husavik, where whale watching is a popular activity. 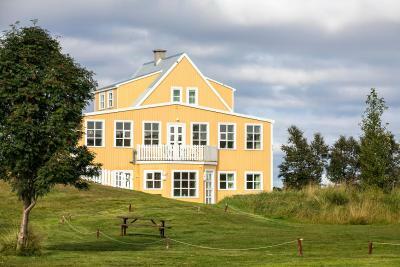 Northern Iceland’s largest town, Akureyri, and the beautiful Lake Myvatn are also close by. 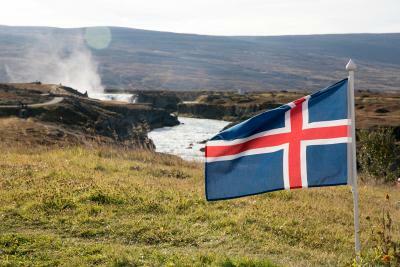 Trout and salmon fishermen can visit Lake Ljósavatn or the Fljótsheiði Moorlands. 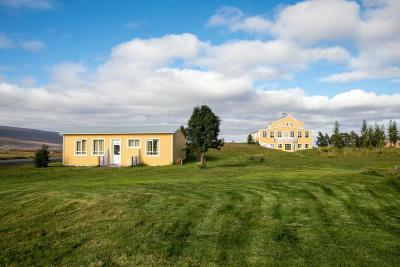 This property also has one of the top-rated locations in Godafoss! Guests are happier about it compared to other properties in the area. 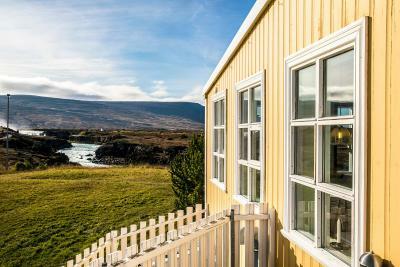 This property is also rated for the best value in Godafoss! Guests are getting more for their money when compared to other properties in this city. 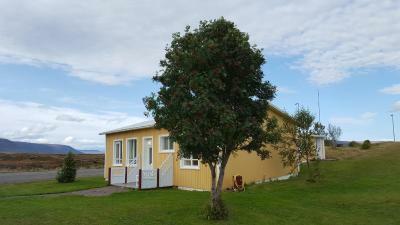 When would you like to stay at Fossholl Guesthouse? Simple room with shared bathroom facilities in the hallway. House Rules Fossholl Guesthouse takes special requests – add in the next step! 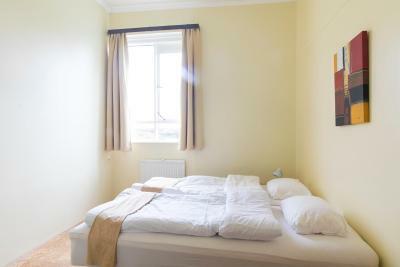 All older children or adults are charged EUR 36 per person per night for extra beds. Fossholl Guesthouse accepts these cards and reserves the right to temporarily hold an amount prior to arrival. Please inform Fossholl Guesthouse of your expected arrival time in advance. You can use the Special Requests box when booking, or contact the property directly using the contact details in your confirmation. Owner upgrades the room to us. It is close to Godfoss around 5mins by walk. We feel cold in the room. 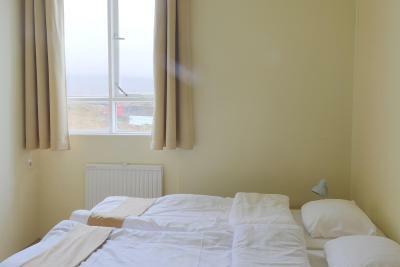 Our room, while very tidy and clean, was a bit sterile, like a hospital room. 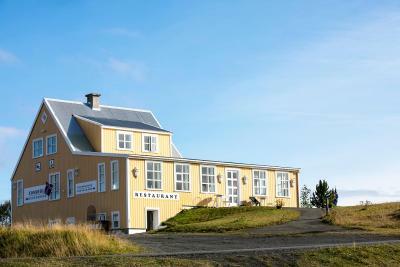 Nearby the Godafoss waterfall , breakfast included , food in abundance . The staff was wonderful! We arrived late after dinner and they were very kind and made us a delicious dinner! It made us feel very welcome after a lot of driving throughout the day. 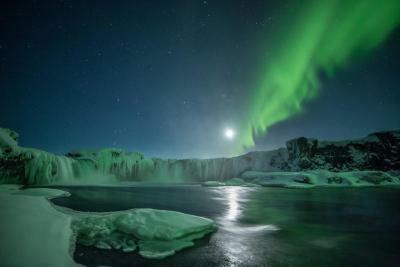 The view and ability to enjoy Godafoss was tremendous!! The owner seems fed up all the time, say good morning and you are lucky to get a nod. The girls she had working there (family or not?) were wonderful. We had to put on the bed linen ourselves - this really is a bit too much of Youth Hostel feeling after having paid 220 EUR for one night. The room was small, one single and one bunk bed (which actually looked like a childrens bed), no lamps at the bedsides. The bathroom was shared as you will find in many Icelandic guesthouses, but this was the first time we actually had to lock the door leading to the bathroom because otherwise the other guests would have had access to our room. The bathroom and shower were clean but looked like in a hospital. There were pipes and hoses visible, and the shower door wouldn't close completely. There was no hair dryer to be found. Hair dryers are not such a huge investment for a guesthouse but they make life a lot easier for guests who are travelling lightly. 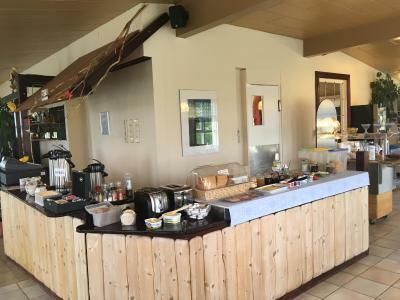 Friendly and attentive service Breakfast buffet with good selection incl. 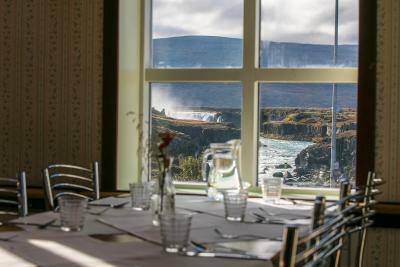 local specialities and fresh fruit Location is just unbeatable - the Godafoss falls are right across the street. Perfect for photographers who want to enjoy morning or evening atmosphere with almost no-one around. Room was little small and outdated furniture.